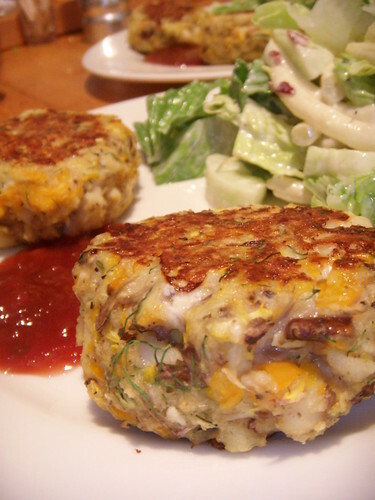 baked yellow squash and cod cakes with hot pluot and garlic jam/sauce, originally uploaded by aarn! +11th August, 2008+. grated a whole yellow crookneck squash, an orange bell pepper, half of a red onion, a few baby portobello mushrooms, a few cloves of garlic, and strained in cheese cloth. added 1/2-lb of skinned and diced cod, about 1/2c. of flour, a couple of beaten eggs, and about 1/2c. of pankos, a splash of canola oil, some salt, pepper, fresh dill, and cayenne, mixed up and shaped. placed on an oiled baking sheet in 400F oven for 12-min on each side. sauce/jam was made a few days prior with a case of overripe pluots and a nectarine, reduced with a 3/4:1 ratio of sugar to fruit, with a ground habenero and a few cloves of garlic. served with a salad of romaine hearts, garden yellow string beans, and garden cucumber. in a dressing of red wine vinegar, grapes, gorgonzola, a little garlic, and some oil, all whipped up together. i'm really feeling this blog. stumbled upon your site via flickr via bikes via another random bike blog. i'm upset that this output goes silent in allston, and that i've just left a city that has potent culinary prowess and creativity going on. keep up the good work. i'm very inspired.